Prediabetes is a condition that 1 out of 3 American adults have, but only 10% are aware that they have it. But what is prediabetes? Does it mean you will need to take insulin and prick your fingers to check blood sugar? How can you take care of it if you have it? Here are the prediabetes basics to know. Jump to the development of prediabetes section. Prediabetes is a stage between normal, healthy blood sugar control, and type 2 diabetes. Blood sugar, or blood glucose, levels are higher in prediabetes than in healthy people, but lower than in diabetes. The same is true for insulin resistance. These are also related to how your body uses carbohydrates. 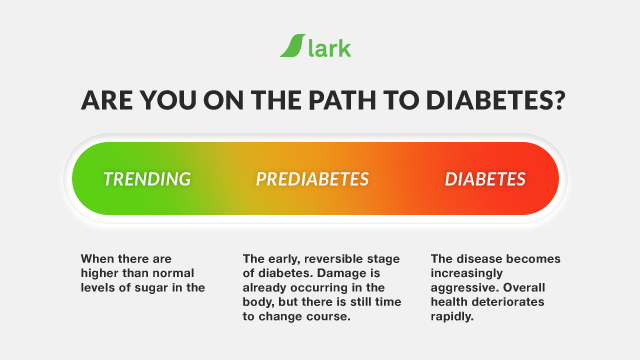 You may have some idea that your blood sugar levels are related to carbohydrates, and all that has something to do with prediabetes and diabetes, but…what? Let us start with normal carbohydrate metabolism, and the relationship to your blood sugar levels. The focus here is on sugars and starches. These are types of carbohydrates that are in foods. The foods can be healthy or less healthy; examples of high-carbohydrate foods include fruit, starchy vegetables (think potatoes, corn, and sweet potatoes), grains and grain products (think cereal, bread, pasta, and pretzels), legumes (think beans, peas, and lentils), dairy products, and sugary foods (think sodas, ice cream, candy, and cake). When you eat foods with sugars and starches, your body breaks down those carbohydrates into a specific type of simple sugar called glucose. The glucose enters your bloodstream, causing your blood sugar or blood glucose levels to rise. This happens after a meal. Another source of blood glucose is your liver. Your liver makes and stores glucose so that you can use the glucose when your cells need it. This can happen when you have not eaten recently, so there is no available glucose from food, or while you are exercising. What happens to all that glucose that is now floating around in your bloodstream? Many cells, such as your muscle and brain cells, need it for energy. If you take in more energy than you need, your body can convert the excess sugar to fat and store it. Here is where insulin enters the picture. Insulin is a hormone that is produced by beta cells in your pancreas. Your fat, muscle, and liver cells all need insulin to be able to take in the glucose from your blood. When your blood sugar levels rise, your pancreas release insulin to help cells in your body take glucose from the bloodstream. Once blood glucose levels are back down to normal, your insulin levels drop, too. Prediabetes and type 2 diabetes are conditions that develop when insulin does not work properly in your body anymore. They develop gradually, often over years or decades, and are usually as least partially related to lifestyle factors that you have some control over. Insulin is released in response to an increase in blood sugar. When you are healthy, the system works well. This carefully controlled system can go awry, though. Here is how the scenario can change if you continually challenge your blood glucose regulation system. A common way this can happen is if you are gaining weight. With weight gain, you are consistently eating more than your body needs. 1. You eat a meal. You eat more than you need. 2. Your blood sugar levels rise. They rise to higher-than-normal post-meal levels. 3. Your pancreas release insulin into your bloodstream. Your pancreas need to produce and release more insulin than normal. 4. Cells in your body use insulin to take up glucose. Cells need more insulin than normal to get the job done. 5. Insulin and blood glucose levels return down to baseline levels. But the system was strained to take care of the extra demands. Age, genetics, a poor diet, being physically inactive, and other factors can also cause an increase in insulin demands or changes similar to those outlined above. Continually asking your body to produce more insulin leads to trouble. You are likely to develop a condition called insulin resistance. That means that the cells in your body are no longer highly sensitive, or responsive, to insulin. Instead, they require more insulin to do the same job of clearing excess glucose from your blood to get blood sugar levels back to normal. Your body will try to keep up with demands, and can be successful for a long time. As your insulin resistance increases, your pancreas can produce increasing amounts of insulin to try to keep blood sugar levels in normal ranges. If this continues, though, the system will eventually break down. At some point, your pancreas will be unable to produce enough insulin to keep up with demand. This can be because your cells develop a high level of insulin resistance, and/or because your pancreatic beta cells, which produce insulin, become exhausted. There are three tests you can get to check for prediabetes. They are all related to your blood sugar. Prediabetes values are higher than the values that are considered normal, but lower than the values in diabetes. Your doctor may order a prediabetes screening test for you, and the American Diabetes Association recommends regular screening if you are 45 years of age or older. You might want to ask your healthcare provider to order a prediabetes test if you have symptoms or risk factors. The risk factors for prediabetes include both lifestyle factors, which you can change, and genetic factors, which you cannot change. Knowing which risk factors you have can give you an idea of whether you are likely to have prediabetes or be at risk for insulin resistance. These are some of the lifestyle, or modifiable, risk factors for prediabetes. · Not getting regular physical activity or exercise. · Eating high amounts of sugar, refined carbohydrates, or fried foods. · Having a diet low in fiber. These are some of the genetic, or non-modifiable, risk factors for prediabetes. · Having a family history of type 2 diabetes. · Being 45 years of age or older. · Being of African American, Native American, Asian American, or Hispanic American ethnicity. · Having a personal history of gestational diabetes or having given birth to a baby weighing at least 9 lb. · Having polycystic ovarian syndrome, or PCOS. Time to Get Tested for Prediabetes? It is best to be on the safe side and get tested for prediabetes even if you do not have symptoms or do not think you have many risk factors. There is data to back this up: a full one-third of American adults have prediabetes, and a shocking 90% of them do not know that they have it! That means these people are not getting the care they need for it, and are more likely to have health consequences or see it progress to diabetes. In some ways, prediabetes and type 2 diabetes go hand in hand. · They are both conditions that result from insulin resistance and inadequate insulin activity. · They both are characterized by high blood sugar levels. · They are both responsive to a healthy diet and exercise program. · Most people with prediabetes will get type 2 diabetes sooner or later. Still, prediabetes is different from diabetes in important ways, including symptoms, complications, and treatment plan. Prediabetes management can center around lifestyle changes, such as eating better and exercising more. Diabetes management is far more involved. · You may be on one or more prescription medications, possibly including insulin that requires injections. · You will need to test your blood sugar at least twice per day, and possibly more, such as before or after meals and exercise, or when you drink alcohol. · You will need to carry blood glucose tablets or another high-sugar snack all the time, just in case you get hypoglycemia (low blood sugar). · You may need to modify your planned exercise session if your blood sugar goes awry. · Participants in the DPP group had a 58% lower risk of developing diabetes. · Participants who were at least 60 years old or who were Asian American had a 71% lower risk. · Participants in the DPP group had more weight loss and increased activity levels than those in other groups. · Increasing your physical activity, with your doctor’s permission. A good goal is to work up to 150 minutes per week of exercises such as walking, swimming, aerobics, and playing tennis. · Improving your diet. You can limit sugary foods and sugar-sweetened beverages, fried foods, and processed and fatty red meat, while increasing vegetables, fish, and other nutritious choices. The DPP has a curriculum designed to help you lose weight and implement the other lifestyle behaviors that can help you prevent or delay type 2 diabetes. The program takes a year to complete and may be covered by your insurance. You can enroll in an in-person DPP with weekly meetings, or opt for a program such as Lark DPP, which you can access anytime on your smartphone. As you would with any health condition, you should work alongside your doctor to manage prediabetes. Along with supporting you in your healthy lifestyle changes, your doctor can order blood sugar tests to monitor your progress, and let you know if there is anything more you should do for your prediabetes. You may even get a prescription for metformin to increase your insulin sensitivity. It is normal to feel confused or frustrated any time you get news that you have a health condition, but you can think of your prediabetes diagnosis as a positive thing. It gives you a chance to make effective and meaningful changes that can prevent or delay diabetes or its complications. · Lower blood pressure and cholesterol. · Enjoy a better mood. Talk to your doctor if you think you may have prediabetes or you want to start monitoring your blood sugar. It could be one of the best steps you take for your health.